However, the owner of a particular copy is entitled, without the authority of the copyright owner, to sell or otherwise dispose of the possession of that copy. In English, an owner of a copyright controls who can make copies and derivative works. But for any particular copy, the owner of that copy can do whatever she wants with it. That means if someone owns a book, she can lend it or sell it. Or if she is particularly in need of some unique bedside tables, she can tear it apart, take a few days and decoupage it to some tables. But she cannot make photocopies of it, create a sequel, or write a screenplay based on the book. This is called the first sale doctrine. One important part of this is that the copy has to be sold to the person holding the copy. If it is licensed, then the first sale doctrine doesn’t apply. The ownership of the copy never transferred to the user, just the ability to use. This is how most software works. We usually don’t buy the copy, we just buy the right to use the software for specific purposes. That is why it is important to understand exactly what your money is buying you: Ownership or license. If there is writing involved, a license is very possible. Read the terms and ask questions. It is important to know what you are buying and what you are not so you can act appropriately. 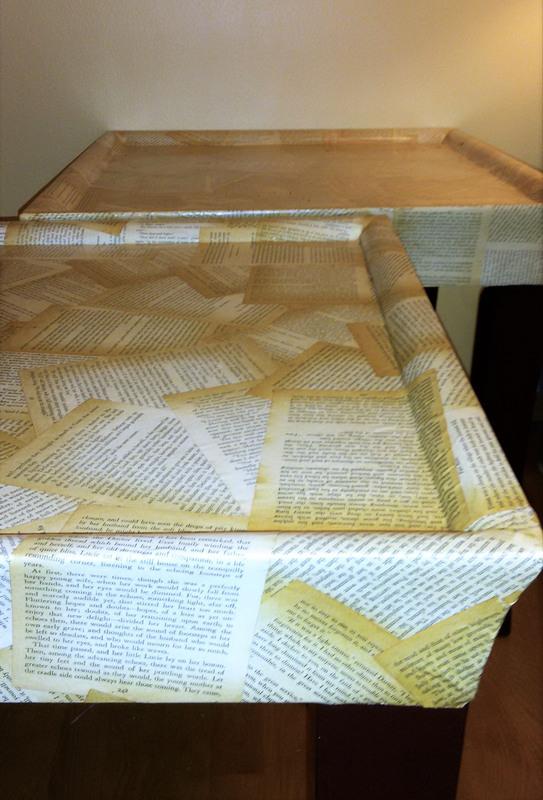 And I recommend varnishing over the paper pages once they are glued on. Which way to Trademark City?